Gurmeet Choudhary who plays Yash in Punar Vivah is called Shashi Kapoor amongst his friends and family. Apparently his grandfather who dreamt of Gurmeet becoming a big actor named him so. he is buddyes Call him as Guru. Who stole your heart the most?..by Criss ...de la ea am articolul..
We have featured some of the good looking TV stars who act exceptionally well and also have made the audience go crazy for their charming looks and fit physique. Gurmeet Choudhary - Nobody would have ever thought that popular on-screen Ram aka Gurmeet Choudhary would rule the hearts of the audience with his flawless acting skills in Star One's Geet Hui Sabse Parayi. Now this actor is wooing all his fans through his performance in Khatron Ke Khiladi Darr ka Blockbuster. Which shows would you want see once again on TV? Take this exciting quiz to choose your favorite show which you would want to see all over again on TV. While many shows have gone off-air these days but it seems that there are few shows which have left its mark on TV so much so that the audience doesn't mind watching it again on TV. Here we present few shows which the viewers are eager to see all over again on Indian Television. 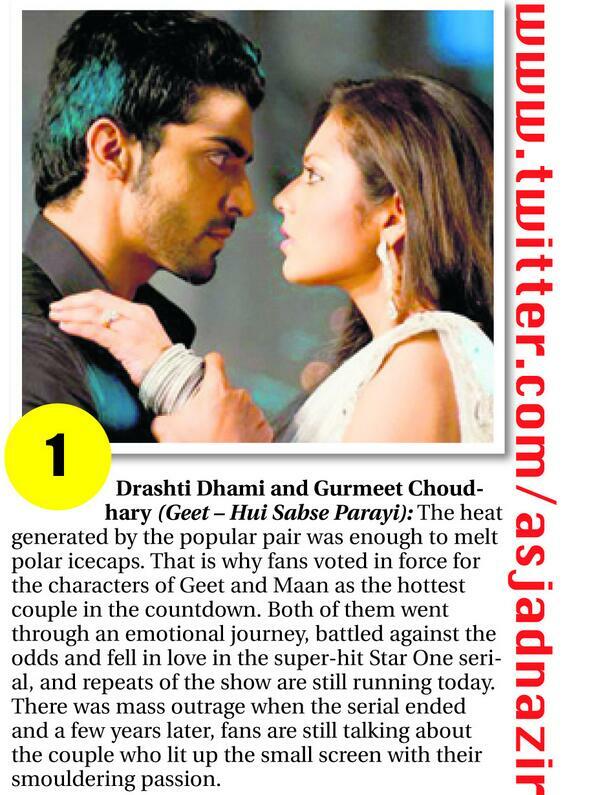 Star One's Geet - Hui Sabse Parayi - The romantic couple Geet (Drashti Dhami) and Maan (Gurmeet Choudhary) who shared some of the coziest moments on-screen were applauded for their chemistry and also for their love struck scenes. The typical Punjabi kudi Geet with her witty acts who is always trying to mellow down her boss Maan's anger made the audience laugh over her acts. Which Jodi would you like to see on-screen again? Take this exciting quiz to vote for your favorite on screen jodi. Maan - Geet - This Punjabi couple Gurmeet Choudhary and Drashti Dhami in Star One's Geet Hui Sabse Parayi, was loved by all especially for their office tussle and the way they used to handle situations. The song which was quite popular during the show was 'Maaahiii' which almost all viewers used to hum. The young businessman “Maan Singh Khurana’ with his striking arrogant looks in the show, Maan Geet, made his fans go wildly mad for him. Gurmeet Choudhary is the hottest personality in Tellywood, handled this role exceedingly well and made this show one of the best and most loved TV show on Televisions. Fans still want to see him as the angry young man on their television screens. Maan Singh Khurana’s popularity set the trend for angry young men character roles on TV screens due to his immense fame and his dynamic presence. Well it might be true for some, but definitely not for all. It thus left us wondering what could have been an alternate career for your favourite stars. Gathering out these 20 popular actors we got our grey cells running and here we bring you a list of what we think can be a good career option for them. 4. 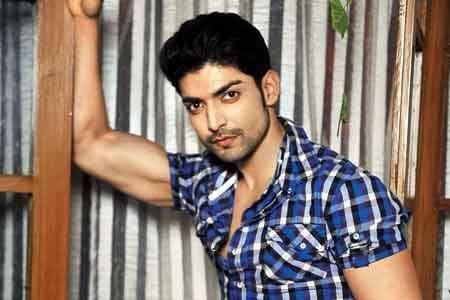 Gurmeet Choudhary - Kick Boxer: He can kick and kick it how! Trained in martial arts the man can any day wake up to start with this profession. With girls learning the trick we are sure his talent will help ward off crimes against woman in our country too. Their relationship might have started on a rough note but one downpour was all it took to change the equations and give Mann (Gurmeet Choudhary) and Geet (Drashti Dhami) their first hug and put them on their way to love. The bubbly Drashti dancing in ethereal white was a visual delight as the macho hero watched her almost ensnared by her beauty as Behne De from Raavan played in the background. Humsafars current track has been inspired from Geet on Star One and the show was produced by the same production house currently producing Humsafars on Sony TV.